Common Descent or Common Design? A high degree of genetic similarity has often been touted by evolutionists as incontrovertible proof for the common ancestry of humans and chimps. Research on protein and DNA sequences has shown a 99% overlap between us and our [alleged] nearest evolutionary relative. The remaining 1% difference is said to have resulted from mutations occurring after chimps and humans split from their shared ancestor. In addition, analyses of chromosome banding patterns have shown a remarkable likeness between chimp and human chromosomes. While it is true that chimps have an extra pair of chromosomes compared to humans, evolutionists regard this as reflection of a chromosome fusion event in human history, sometime after the presumed split from a common ancestor. Before one assumes that the case is closed in favor of common descent, the rest of the story (at least, what science knows of it so far) should be taken into careful consideration. Whenever genome-to-genome comparisons were made in a 2002 study, striking differences between humans and chimps were revealed. In the places where human and chimp DNA fragments aligned with each other, there was a 98.77% agreement; but a significant portion of chimp DNA fragments–15,000 out of 65,000– did not align with the human sequence at all. Another significant discovery is the fact that even slight differences in the genome have dramatic manifestations in terms of morphology, physiology, and behavior. For instance, there is a small variation in the human FOXP2 gene that causes the protein to have a different shape from that of the great apes’ protein. It is known that human mutations in the FOXP2 gene result in severe language disorders that involve an inability to properly control the lips and tongue, the use and interpretation of grammar, and the comprehension of speech sounds. Thus, it has been concluded that the human FOXP2 protein is integral to the development of brain structures involved with language capacity. Obviously, language ability is a significant distinction between humans and chimps, so the seemingly small difference in their FOXP2 proteins must have massive ramifications. 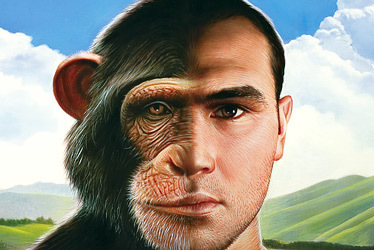 In essence, the impact potential of the subtle differences observed in human and chimp genes should not be underestimated. So-called “junk” DNA has also been used as a strong argument for common ancestry. This is a region of the genetic sequence that supposedly results when a functional segment of DNA is rendered non-functional by undirected biochemical processes plus random chemical or physical events. This “junk” segment is retained by the organism’s genome only because it is attached to functional DNA, and it persists from one generation to the next. Evolutionists point out that humans and the great apes share many of these sequences, and consider this strong support for their common ancestry argument. However, a minor revolution has taken place in molecular biochemistry in recent years. One by one, these sequences are proving to be utilitarian, and in some cases essential to the organism. One example comes from the class of “junk” DNA called pseudogenes. A good example is the Makorkin-1-p1 pseudogene, which is a partial copy of the Makorkin-1 gene, a gene whose disruption causes fatality in mice. It has been argued that this pseudogene originated from a duplication of the Makorkin-1 gene and then suffered a deletion that rendered it impotent. However, it turns out that this pseudogene has an important purpose. In order for the cell to produce the Makorkin-1 protein, RNA copies of both the gene and the pseudogene are required. The messenger RNA from the latter protects the messenger RNA of the former from breaking down, an occurrence that would prove fatal to the mouse. Essentially, this so-called “pseudogene” is involved in the animal’s survival. As evidence accumulates, the argument from genetic similarity and shared “junk” DNA to support common descent is being severely undermined. The strong similarities that do exist between chimps and humans are not a problem for the creation model. Rather, they could be anticipated from a design perspective. It could be asserted that genes are like building blocks that can be assembled by a designer in a myriad of different ways. In fact, Genesis uses the word “asa“ whenever referring to the physical creation of man, a word which means to fabricate from pre-existing material. The discovery that genetic sequences previously thought to be evolutionary “junk” indeed have important functions means that evolutionary history doesn’t have to be used to explain their occurrence in the human and chimp genomes. From a creation perspective, they too can be regarded as an instance of common design. FANTASTIC New Apologetics Resource for Kids and Teens! !